Did you know that the chocolate chip cookie was a serendipitous discovery? When Ruth Wakefield, owner of the Toll House Inn, ran out of baker’s chocolate, she tossed some semi-sweet chocolate chunks into the batter, hoping they would melt while cooking. Instead of chocolate cookies, what came out of the oven was a delicious surprise, and chocolate chip cookies were born! 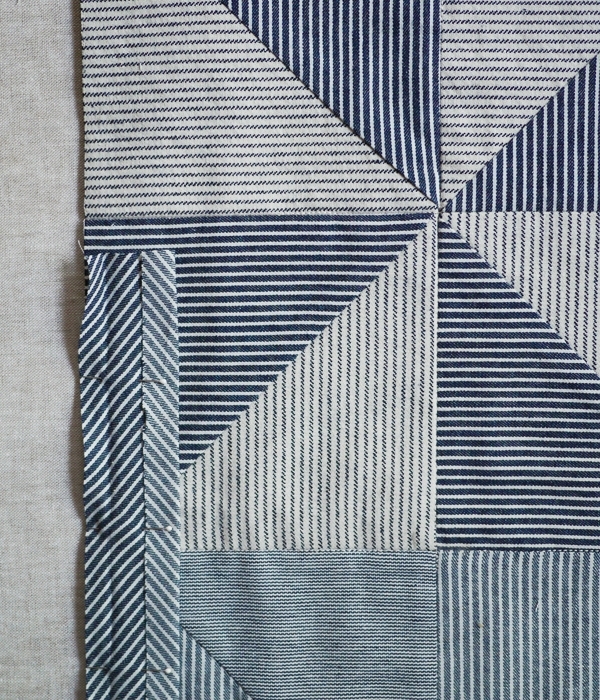 The design for my Denim Pinwheel Quilt was just such a happy accident. 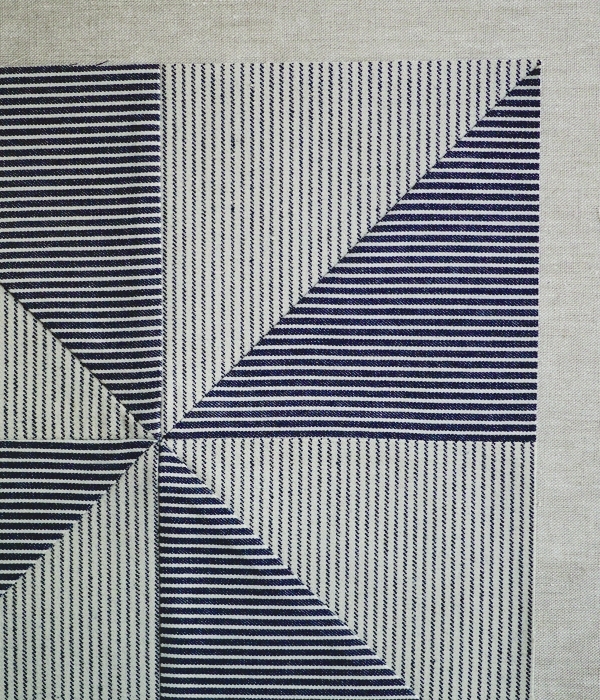 We had just gotten in Robert Kaufman’s Railroad Denim, and excited about every fabric in the collection, I sewed up a bunch of combinations for our Big Pinwheel Pillows. As I laid all the sample squares out on the table at our weekly Bee meeting, the reaction was the same all around: These were going to make beautiful pillows, but my gosh, they should also be a quilt! And we were right! 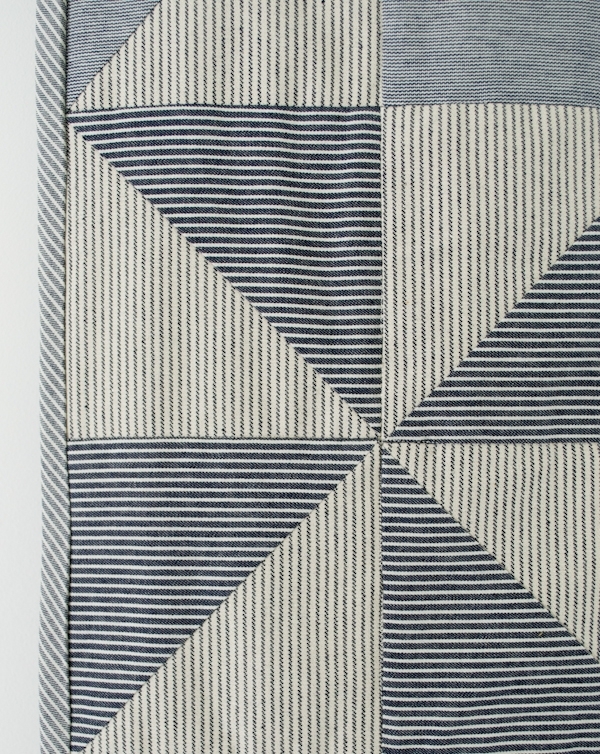 The quiet complexity that comes from mixing various Railroad Denim stripes gives this quilt such a rich story. 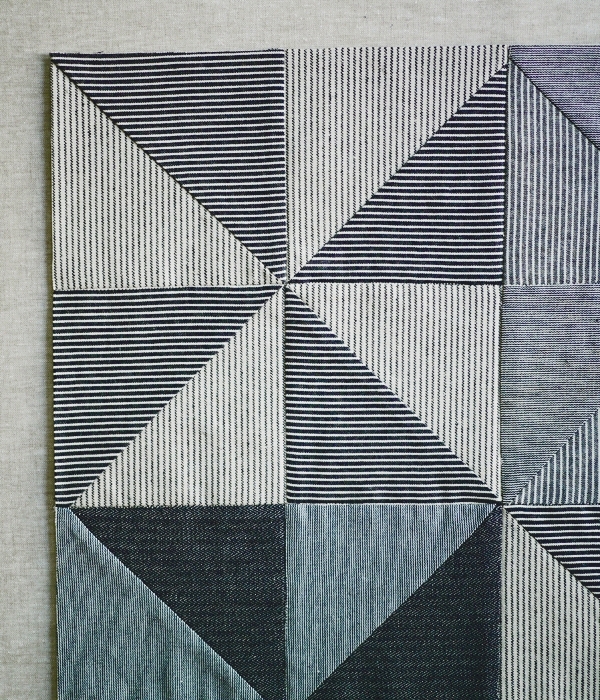 The grid of nuanced color variations is reminiscent of a minimalist painting hanging in a museum, yet the humble denim cloth reminds me of my grandfather’s overalls, all lined up on the hooks beside the door of his farmhouse. The perfect mix of classic and modern. Use 1/4-inch seam allowances unless otherwise noted. 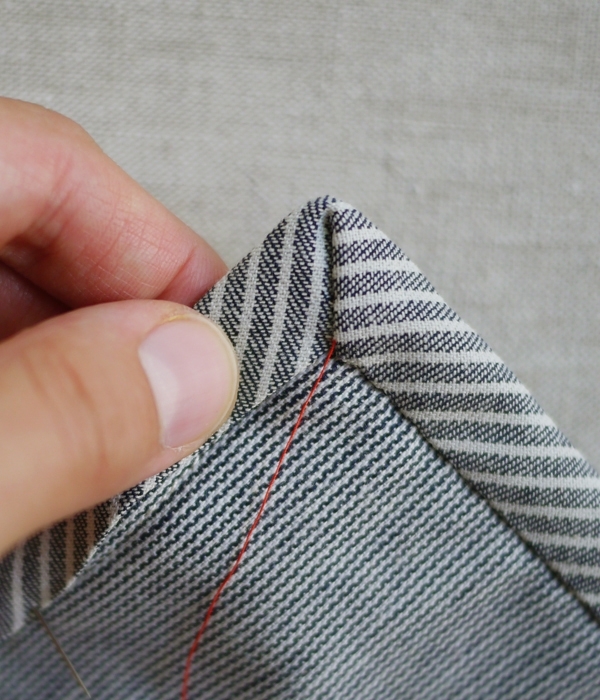 When piecing, please note that you can use both the right and wrong sides of the Medium Stripe and Deluxe Twill Stripe fabrics, just make sure the fabrics are facing with the proper side up before sewing. Have fun creating different combinations! For the Pinwheels, cut a total of 120 6 ½-inch squares from the fabrics. 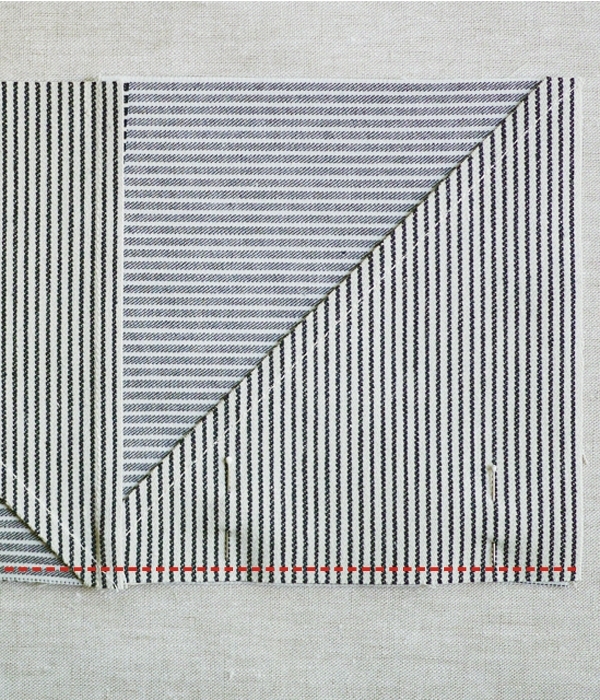 For the Binding, cut the Binding fabric (the Medium Stripe) on the bias (at a 45-degree angle to the grain of the fabric) in 2-inch strips. Cut enough strips so that when pieced you have a total of 232 inches. 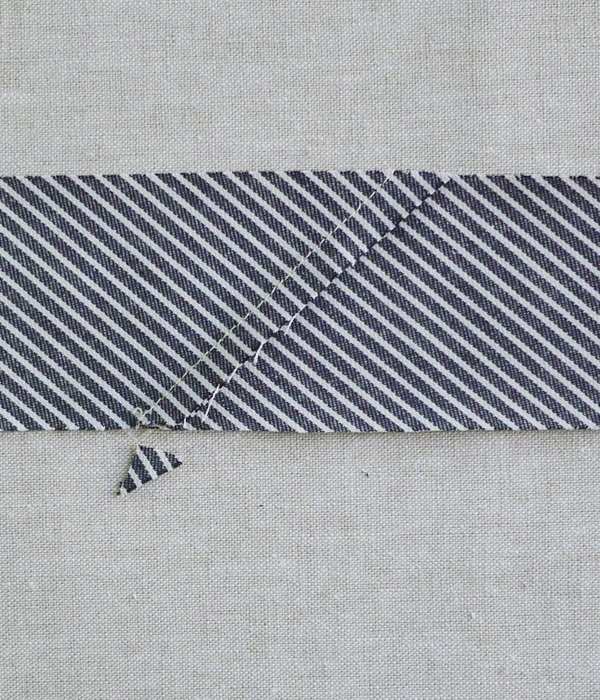 For the Backing, cut a 56-inch by 66-inch rectangle from the Backing fabric (the Micro Stripe). To make the quilt in Twin (Double, Queen, King) sizes cut a total of 216 (288, 360, 440) squares. These will piece up into 54 (72, 90, 110) Pinwheel Squares to be arranged in a grid of 6 x 9 (8 x 9, 9 x 10, 11 x 10). 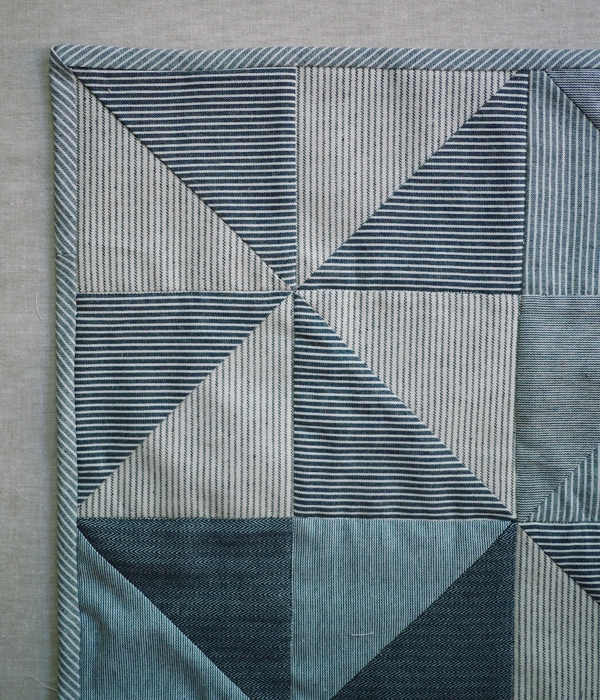 The Binding for the larger sizes should be pieced long enough to go around all four sides of the quilt with an overhang of at least 12 inches. The Backing should be pieced and cut to at least 6 inches larger in length and width than the finished quilt tops. 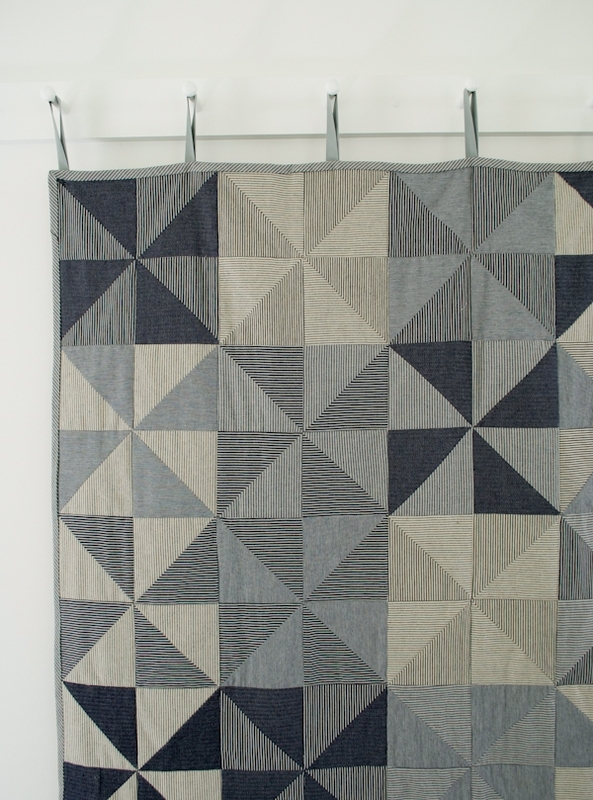 Each Pinwheel Piece is made from 4 squares of two colors of the Pinwheel fabric. You will need two squares of each fabric. The square in this example uses two squares of the Medium Stripe with the right side as the proper side, and two squares of the Deluxe Twill Stripe with the wrong side as the proper side. 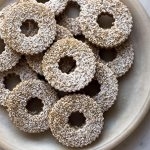 Lay one small square with the proper side up. 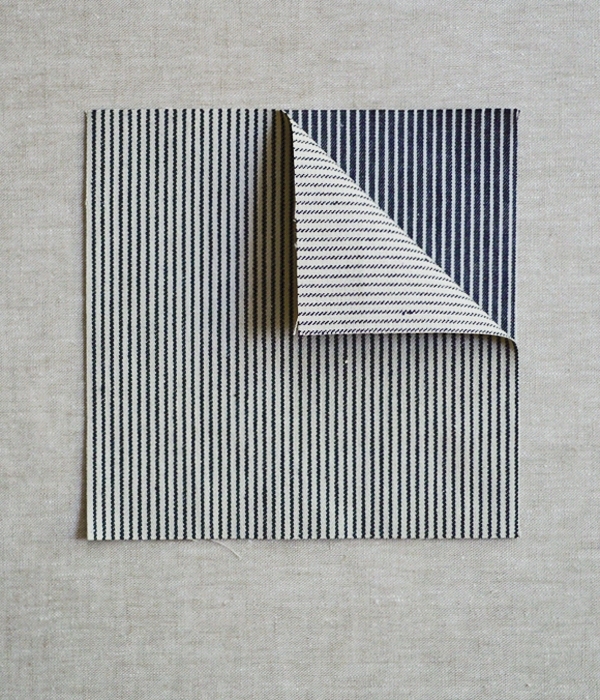 Place a second piece on top with the proper side down and the stripes parallel to the first square’s stripes. Repeat with remaining two squares. 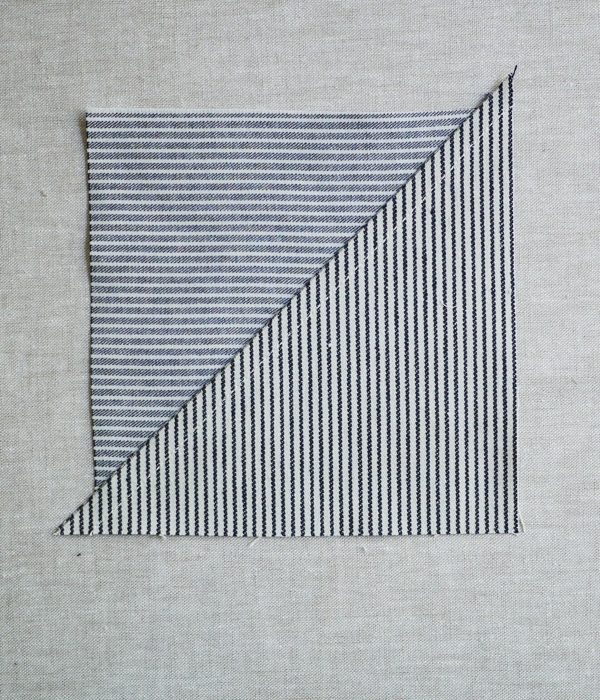 Lay out the four pieced squares as shown above, making sure that all adjacent stripes are perpendicular to each other. Repeat with remaining small squares until you have a total of 30 finished pinwheels. 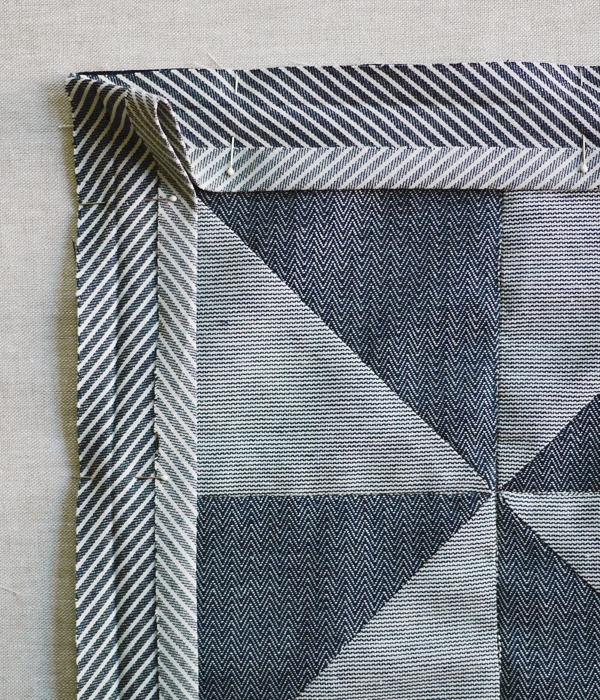 Trim the finished pinwheels down to 10 ½ inches square, making sure to keep the straight seams centered. 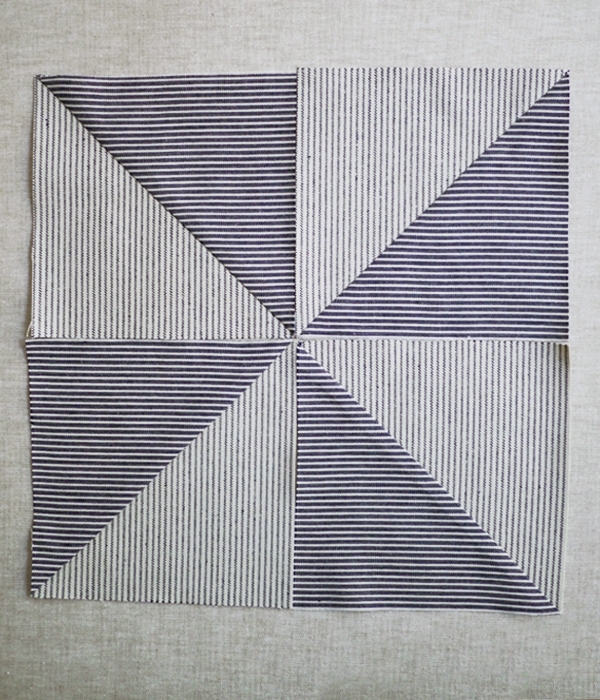 In an open space, lay the squares out to arrange for the quilt top, making sure that all adjacent stripes are perpendicular to each other. For the throw size, arrange 5 squares across and 6 rows down. 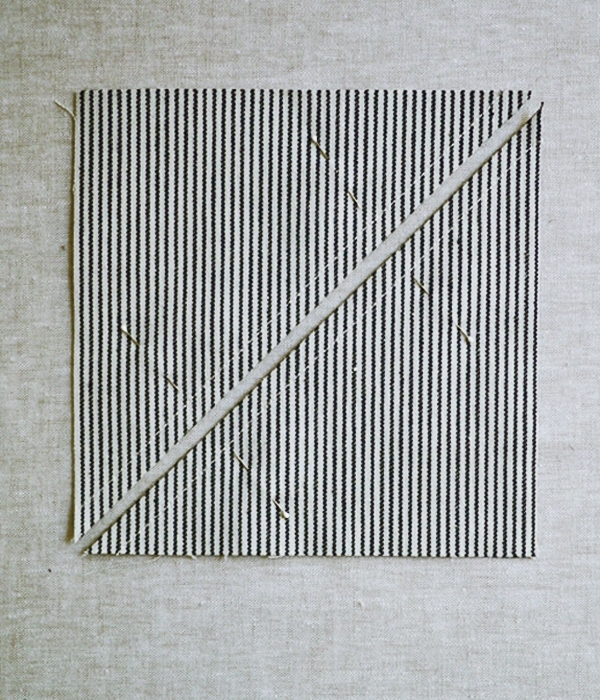 Sew together the strips of 5 squares to start, making sure that all straight seams are aligned. Press seams to one side. 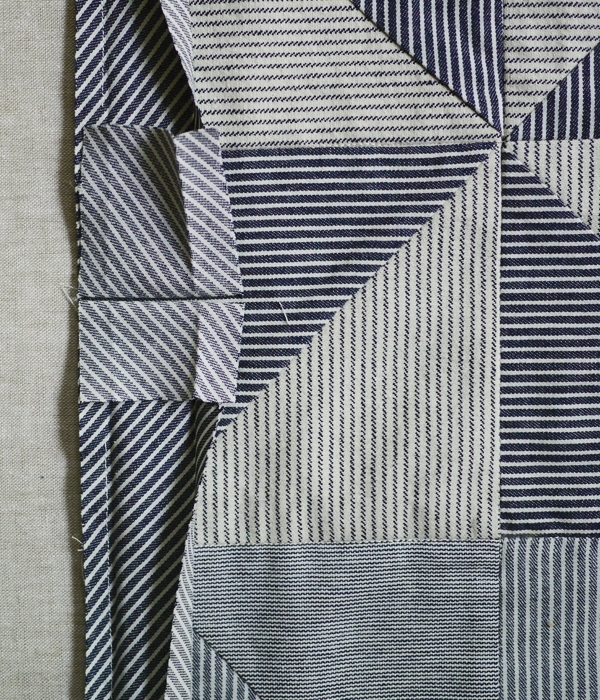 When you have 6 strips of five squares, sew these together along the long sides, making sure that all straight seams are aligned. Press seams open. 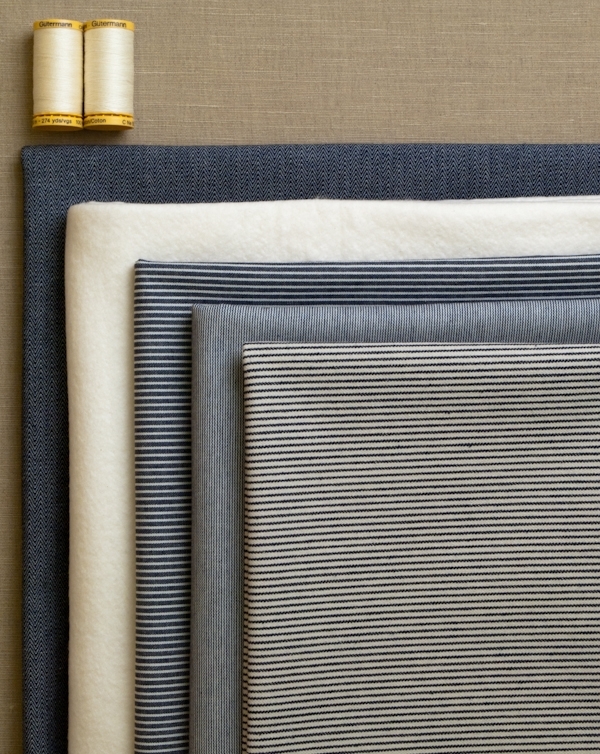 Lay the cut piece of the Backing fabric (the Micro Stripe) right side down smoothly on a flat, clean surface in a large, open space. Cut a piece of the batting just a little bit smaller than the backing fabric (about 53 by 63 inches) and center it smoothly over the backing. Finally, place the quilt top, right side up, onto the backing and batting layers, centering it so that the batting and backing show around all four sides. This is the quilt sandwich. Pin-baste the quilt sandwich with curved arm safety pins. 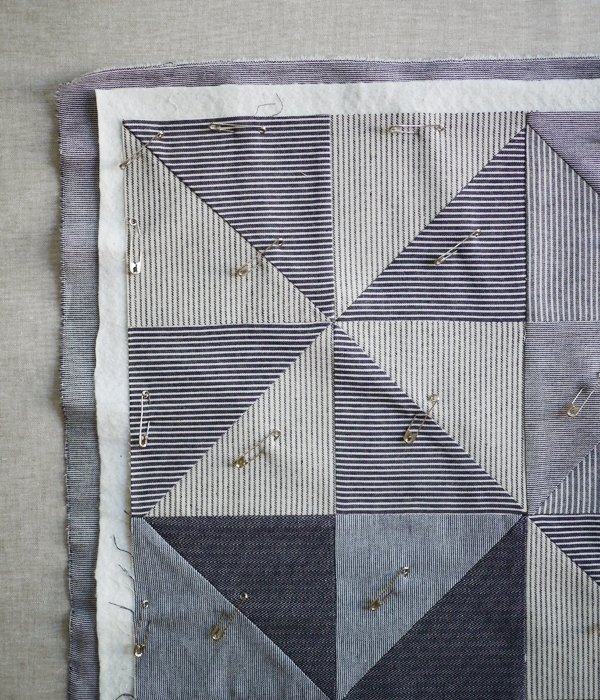 Place the first pin at the center of the quilt, making sure to pick up all three layers: backing, batting, and quilt top. Then, pin outward in concentric circles 3 to 5 inches apart. Pin all the way to the corners and edges. You can quilt in any pattern you like, as long as there are quilting stitches no less than 8 inches apart. We chose to “stitch in the ditch” for our quilt, sewing along the straight seams of the pieced top as illustrated in the picture above. 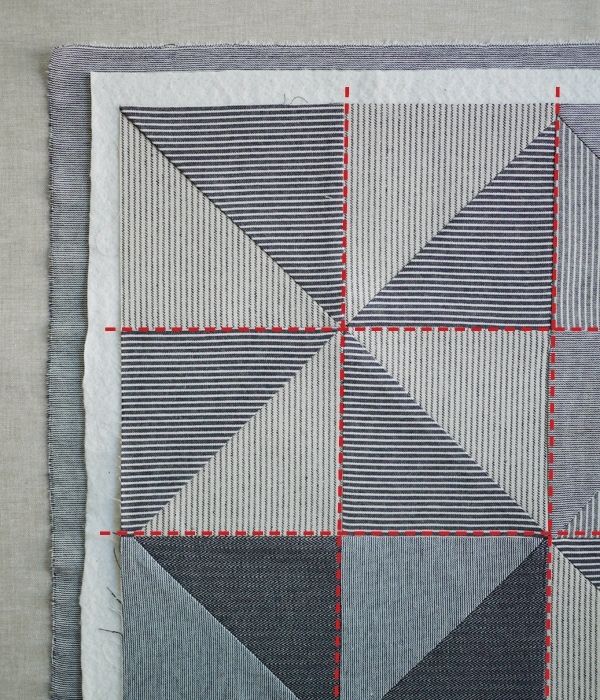 To quilt by machine, use your machine’s walking foot and sew right beside the seam on the side without the seam allowances pressed under it. Quilt all vertical and horizontal straight seams. 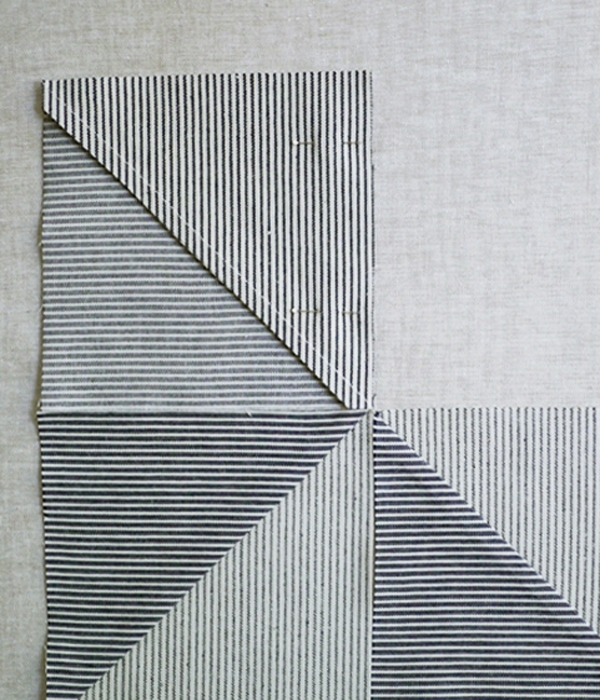 Once you’ve finished quilting, trim the batting and backing to match up with the top. (I used the wrong side of the Medium Stripe fabric as the proper side of the binding strips.) 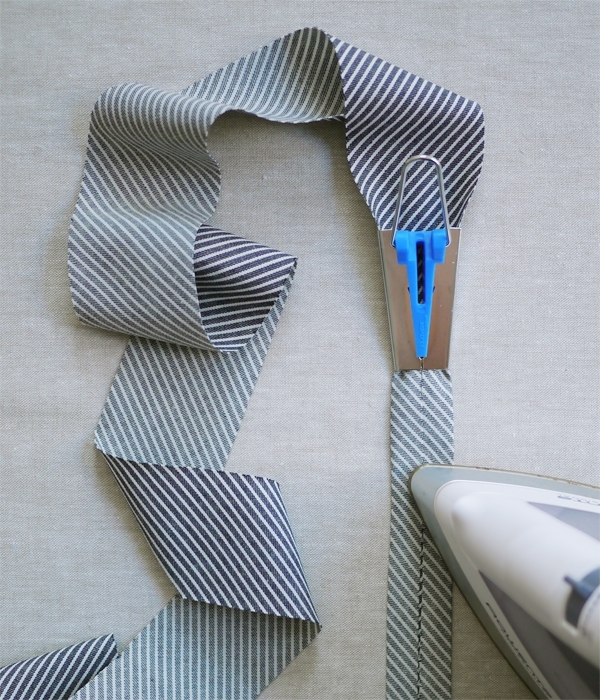 To piece the strips, pin the short ends together at a 90 degree angle with proper sides together. The points should overhang about ¼ inch on each side. 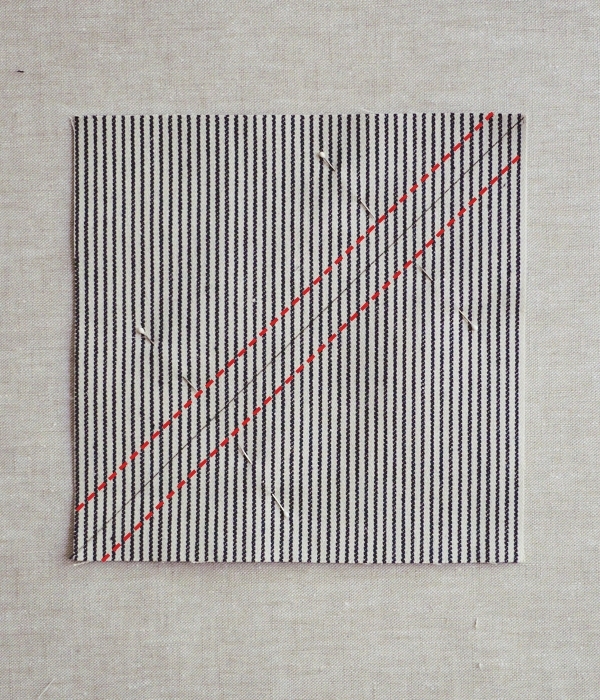 Edge stitch. 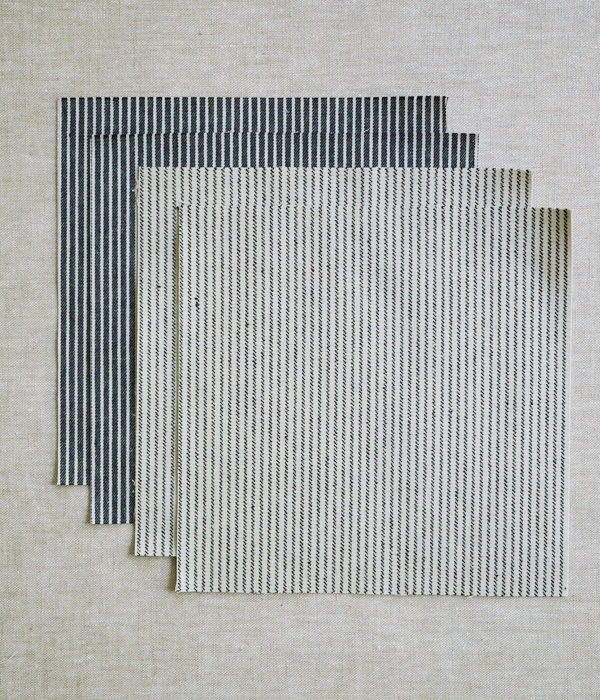 Once you have one long strip of bias tape, use the 1-inch bias tape maker (following the manufacturer’s instructions) to press the bias strip into single fold bias tape. Love this! Not only does it have art appeal, but I could see it becoming a kid's favorite blankie to haul around. More durable than quilting cottons and getting softer with age – just like a favorite pair of jeans. 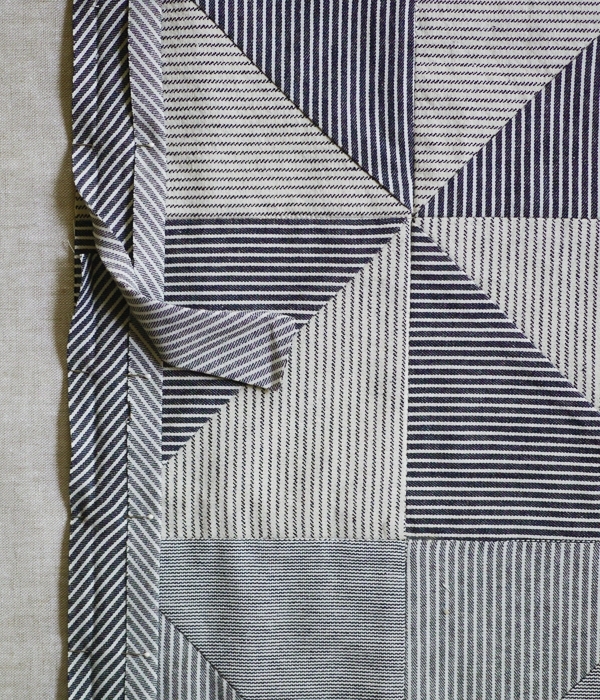 I really like this quilt,it looks vey calm and fresh…. Yes! This fabric couldn't have arrived with any more perfect timing. My son's second bday is coming up and I want to make train conductor hats an have been looking for the perfect fabric! Truly beautiful. 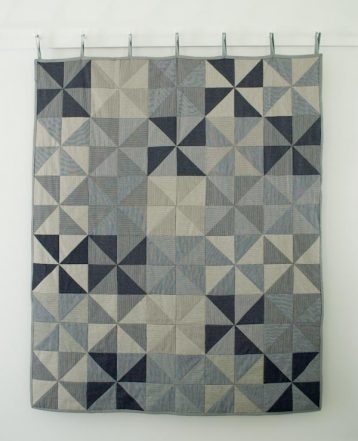 I have been wanting to start quilting and this looks like a nice first project. It would be a hit around the house, too, since both my dad and fiance love everything about trains and the railroad. 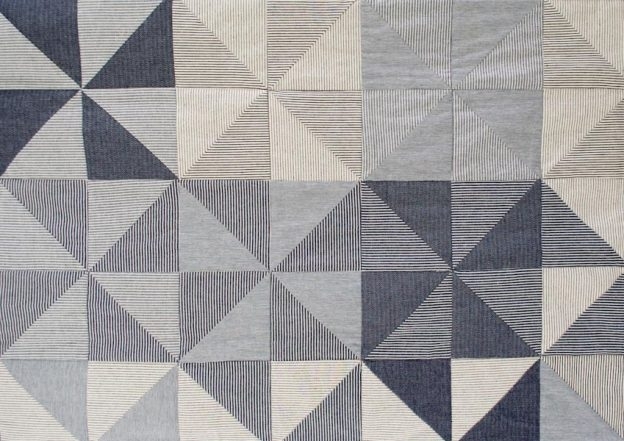 Could you please give the final dimensions for the throw sized quilt? This is quite lovely! The finished measurements of the quilt are 50 by 60 inches. I love this quilt!!! A great idea for a guy gift!! I would love to pin this to my Quilt & Sew board!!! Wowzers—absolutely gorgeous, and can't wait to get started! 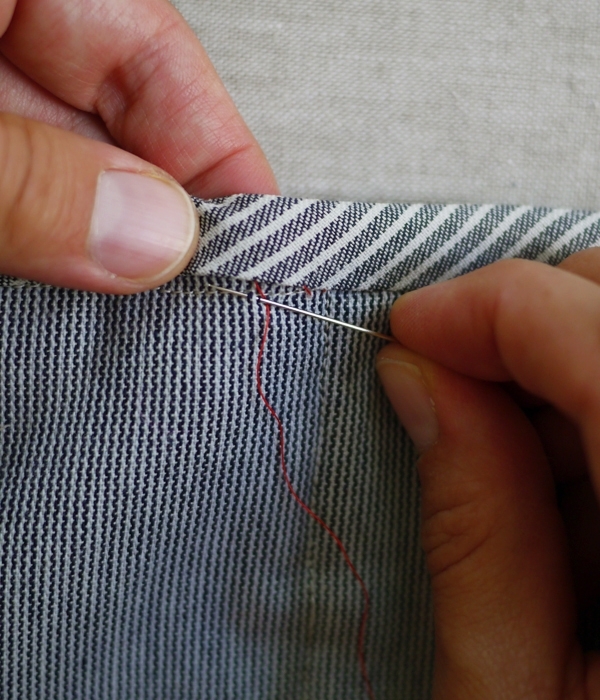 Who knew such a workaday fabric like denim could take on an almost artful quality when stitched up like this? A matching denim bear or bunny (from your tutorials in late winter/early spring) would make a lovely addition for a shower gift. Love, love, love! 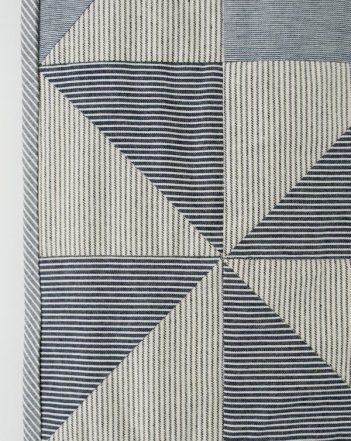 Will definitely add to my to do list and finally end that long search for the perfect pattern for my brothers quilt. Love this! What size is the quilt shown in the main photo? Hi- This is beautiful! Could you add some pictures or info about the hanging loops you made? How/where and at what point in the process of binding did you add them? 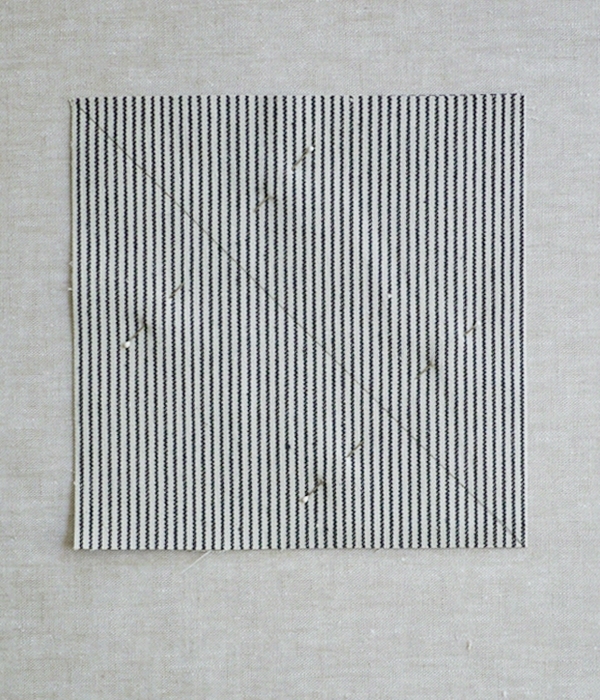 It is 50 X 60-inches. The measurements are listed under the "Finished Measurements" section of the pattern. Thank you so much for writing in! Love it! I've made plenty of quilts, but this is my first kit. Included instructions would have been nice; I always measure when I get fabrics by mail, but I had nothing to go by. Other than that, I'm looking forward to making this for my husband! Thanks for your comment. This is just a materials kit, and the instructions can be found here. I'm sorry if you were expecting something different! Please let us know if you have any questions about the pattern. Thank you! We actually only added the hanging loops for the photograph, so we tacked them to the back of the quilt using a few safety pins to keep in place. 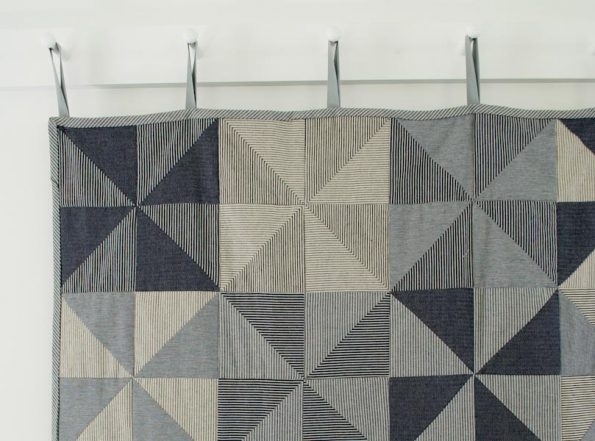 If you are planning on hanging the quilt short-term, this is a fine solution. 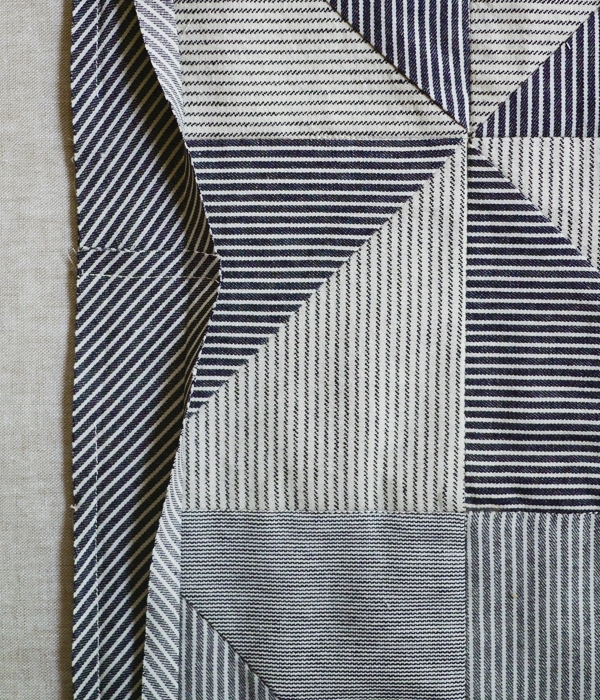 For a more permanent method I would recommend sewing the loops into the binding by pinning them to the wrong side of the quilt in the same step that you are pinning the binding to the right side of the quilt, with all raw edges together. Machine sew over all layers. 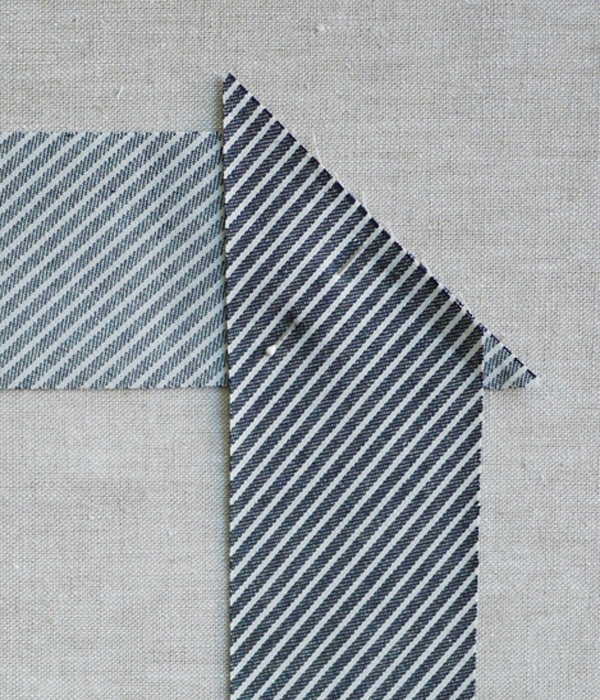 Fold the binding over the raw edge and blind stitch to the wrong side as described in the project journal. 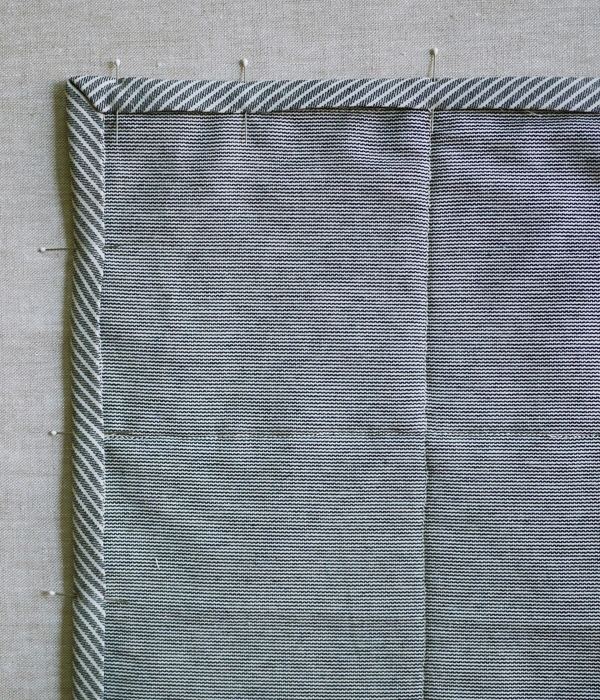 Once you are finished, fold the hanging loops up and secure to the binding with a whip stitch. 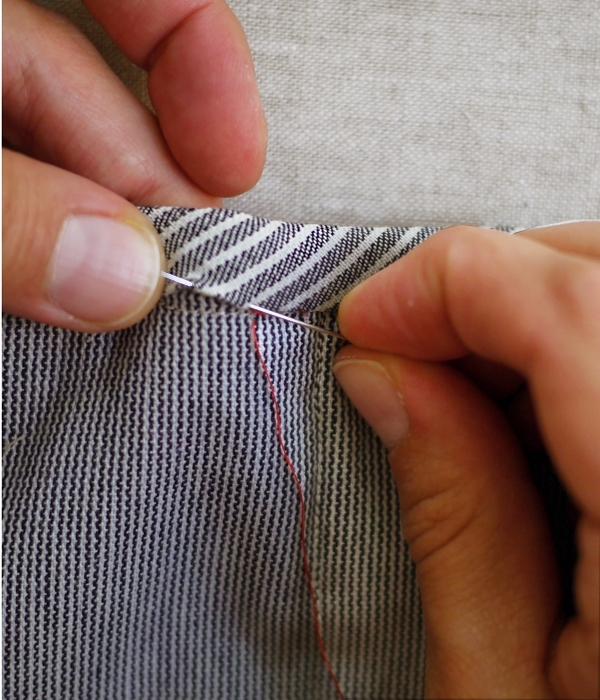 With any method you use, make sure that you don't have too much pressure in any particular spot, or the seam will tug and pull. Thank you so much for your question – I hope this helps! Just wondering what the finished size of the QUEEN quilt would be? Sorry, didn't see it anywhere in the post..thank you! Thank you for pointing out the missing dimensions for the additional quilt sizes. I've added them all in. The finished size of the Queen quilt is 90 by 100 inches. I’m finishing up the throw size quilt for a customer and I’m wondering how you pieced the back from the 2 yards of fabric? I can’t seem to figure it out. I think I need at least 3 to account for the overage. Please help. Thanks. The throw size is 50 X 60 inches and the backing fabric is 56-inches wide so you don’t have to piece the back at all, just cut a piece 56-inches by 66-inches. Hi, I just purchased the kit and am wondering if the fabric included is already pre-washed or if I still need to do that? The fabric is not pre-washed so you’ll have to do that before you get started. I’m totally new to quilting, and need to purchase a non-slip quilting ruler and self-healing cutting mat–I see online that there are many different dimensions of each available at a very large price range. If I’m making the throw sized quilt, what’s the smallest size of both the ruler and the mat that I can comfortably get away with? And what are some recommended brands of each? For rulers in general we recommend getting a 12 1/2-inch square ruler and a 24 1/2 X 6 1/2-inch ruler but if you’re looking to save space I’d recommend getting a 12 1/2 X 4 1/2-inch ruler instead of the 12 1/2″ square. I’d still recommend getting the 24 1/2 X 6 1/2-inch because it’s so useful. You need to get two rulers in order to measure and cut properly. And it’s important that they be non-slip and specifically for rotary cutting. 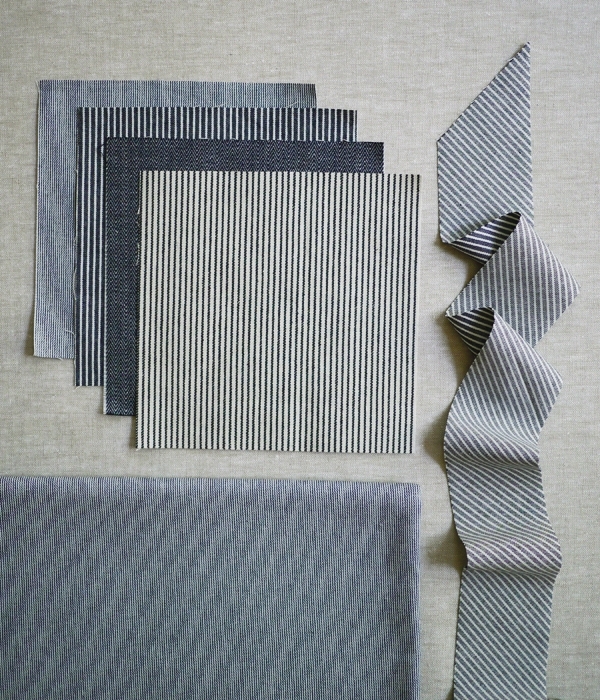 We recommend Creative Grids brand and you can see our selection here: https://www.purlsoho.com/purl/company/177-Creative-Grids. Thanks so much for all of your really helpful answers Molly. I didn’t have the money to buy all the extra equipment (rotary cutter, mat, rulers) so I just went with a pair of scissors, the regular ruler I already have, and a really steady hand–the quilt is coming along super well! I purchased this kit and am in the process of putting the triangles together. I’m doing it all by hand. I am confused about how the different strips go in the fabric. Do you alternate the horizontal and vertical strips with each square? 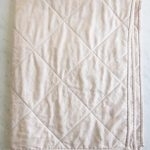 Is this important for the look of the finished quilt? I am so impressed that you are sewing this by hand! What a big and fabulous project. I’m not sure I completely understand your question, but I think the answer is yes. 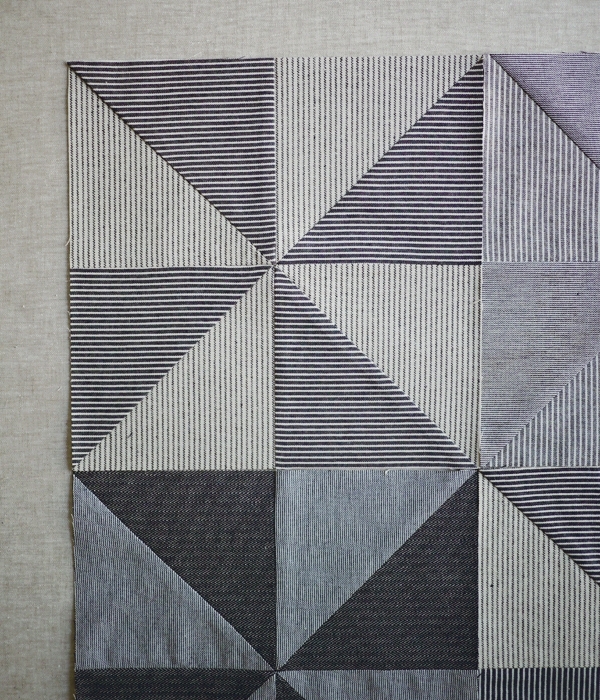 I designed the quilt and the instructions so that it would be possible for all of the stripes on the individual pinwheel squares to line up perpendicular to the stripes on the other squares, rather than in line. I did this because I found that trying to line up all of the stripes of varying widths was tricky in practice, and hard on the eyes. This is of course a matter of taste. 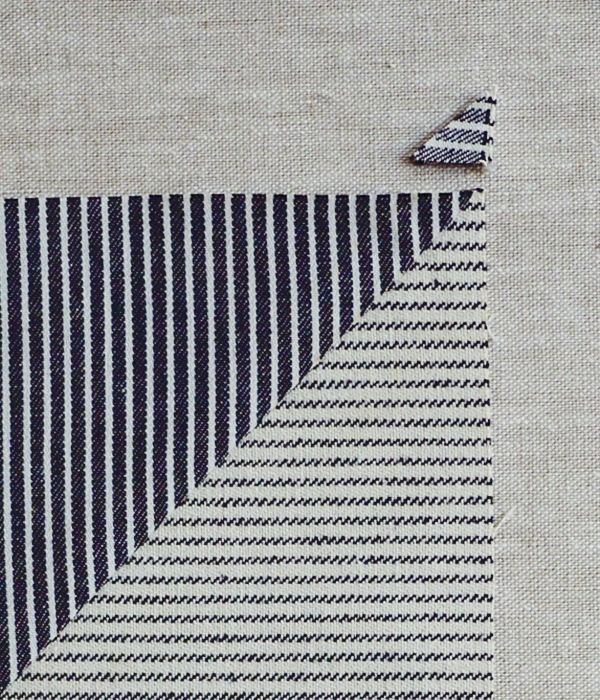 If you prefer the look of the stripes running in the same direction from square to square there is no reason you can’t assemble it in this way too. I suggest laying all the finished squares out and playing with the arrangement before you begin piecing them together so that you are sure to get just the right arrangement for you! I hope this answers your question. Please let me know if I can help with anything else! I’m in the final stages of this project, but I’m having some issues with the bias tape/bias tape maker. I’ve never used one before, so it may just be an operator error, but the 2.5″ wide strips seem to be too wide for the 1″ bias tape maker. As I make the tape by running it through the device, it gets bunched up on the “front” and there becomes a gap between the raw folded edges on the “back”. Did anyone else have this problem? I know the simple solution may be just to trim the strips down in width, but it looks like yours turned out fine at 2.5″ wide- so do I just need more practice/patience? Am I crazy? Has the simple device turned against me?! You are right! The 2.5″ strips are too wide for the bias tape maker. Thank you for pointing this out! Either technique will give you the same, beautiful result in the end. Thank you for your keen eye on this pattern! Can you update the pattern to reflect this? I just went out to buy a new bias tape maker and consulted the comments when I had trouble with the 2.5 inch strips I made. Thanks for writing back! We have made the update! Our apologies for the delay! A beautiful quilt! Do you sell this in a packaged kit in the size show? Thank you! Thanks for writing in! 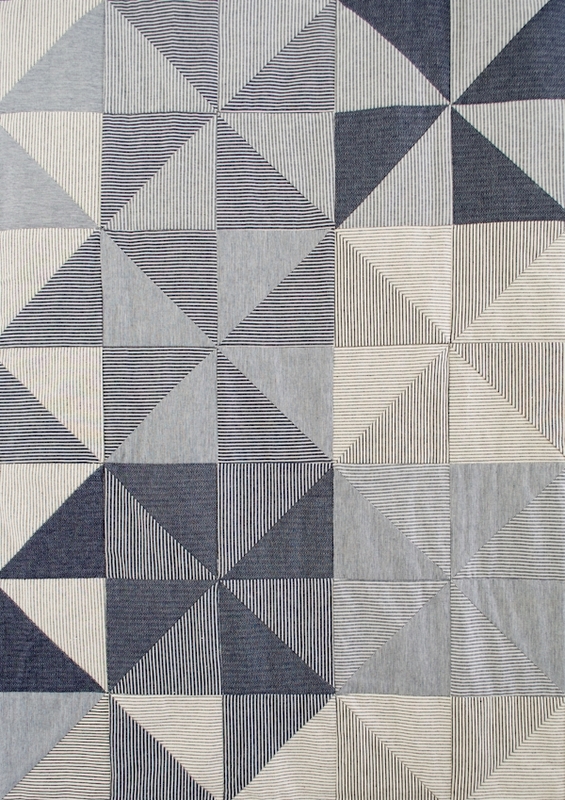 We do not carry a kit for this lovely quilt but we do carry all of the fabrics and they can be purchased separately! Hi. I love this quilt! Thank you for posting such thorough instructions. Can you explain how to convert the yardage given above (for the quilt top) to fat quarters? For example, the full size calls for 7.25 yards. I have 18 fat quarters which I’m guessing equates to 4.5 yards (18/4). Is this math correct? So I’ll need to supplement 2.25 yards or 9 more fat quarters? Thanks for reaching out! 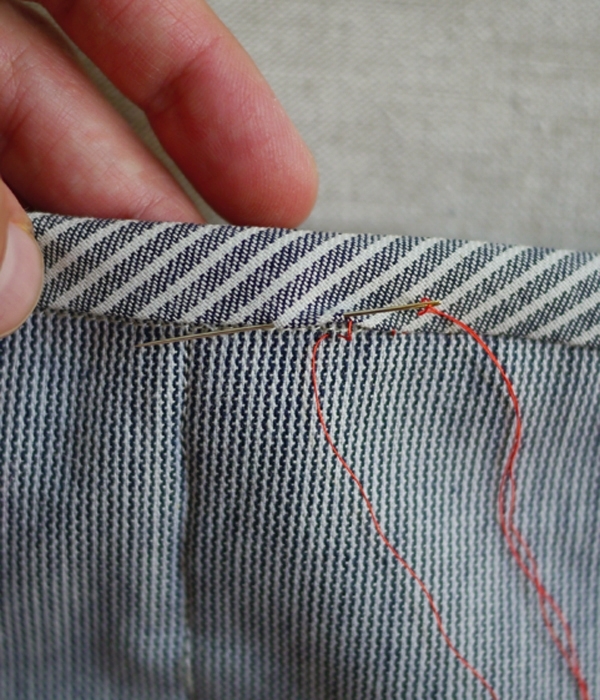 You are correct that you would divide your number of fat quarters by four to get the total yardage equivalent; however, I would keep in mind that Railroad Denim is a 60″ wide fabric, so if your fat quarters came from a 44″ wide fabric, you will need a bit more yardage. Also, there will be some waste when using fat quarters, as the pinwheels start by cutting 6.5″ squares, and a typical fat quarter is 18″ wide. Although it takes a bit more math and planning, I would instead estimate how much fabric you need by first determining how many squares you can cut from each fat quarter (either 6 from a regular width fabric or 8 from a wide width) and then dividing 288 (the number of squares needed for the Double size) by that number. I LOVE this quilt! The fabric, the pinwheels, the colors, all of it. I am an old hippie from the 60’s, that must be why. I am definitely going to make this. Thank you so much! I see now that this post is 5 years old. I would love to order the fabrics if they are still available but the link states that it is not. Can you tell me if I can still get the fabric. I would love to make this. Thank you for reaching out and for your kind words! 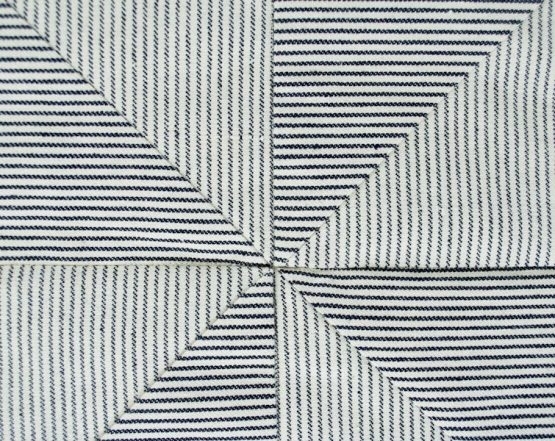 Unfortunately we no longer carry this fabric, but with a quick google search you should be able to find Robert Kaufman’s Railroad Denim.